On April 14th, 1994, two Blackhawk helicopters were ready for take-off from Diyarbakir, Turkey. Colonel Jerry Thompson was changing command (or co-command as "command" of Provide Comfort was shared with Turkey). He decided to show his replacement, Colonel Mulhern, the lay of the land. At 0730, Colonel Thompson assembled 26 people that comprised important (command group) roles for the mission, among them was my replacement. He included French, British, and Turkish commanders and laisons, and also brought along Kurdish para-military personnel and linguists. The two Blackhawks were designated Eagle-1 and Eagle-2. Their first destination was Irbil, Iraq, but they would have to make a stop in Zakhu, Iraq (where the military part of Provide Comfort operated). There were plans to visit several other areas as well. At 8:22AM, Eagle Flight departed Diyarbakir. They were headed East-Southeast for a "gate" into the No-Fly Zone. Per Standard Operating Procedure, the command group was split between Eagle-1 and Eagle-2 to ensure continuity of command if one helicopter went down. At 9:21AM, Eagle Flight called the AWACS (callsign "Cougar"). They requested and were granted permission to enter the "gate" into the the No-Fly Zone. At 9:24AM, Eagle Flight lands at Zakhu, Iraq. At 9:35AM, two USAF F-15 fighters launched from Incirlik, Turkey. They were designated Tiger-1 and Tiger-2. Tiger-1 was the lead fighter with Tiger-2 as the wingman. Tiger Flight was headed to patrol the No-Fly Zone. At 9:54AM, Eagle Flight calls the AWACS to report departure from Zakhu, Iraq, with a destination of Irbil, Iraq. At 10:12AM, Eagle Flight enters mountainous terrain. It's Identification Friend or Foe system (IFF) failed. At 10:20AM Tiger Flight passes through "gate" into No-Fly Zone. At 10:22AM Tiger Flight picks up radar contact at forty nautical miles. No IFF reading occurs. Tiger-1 reports, "Cougar, picked up helicopter tracking northwest bound." AWACS says the area should be "clean". At 10:25 AWACS responds that there are "hits there" in the No-Fly Zone - confirming Tiger Flight's radar contact. Tiger Flight makes visual contact with Eagle Flight at five nautical miles. At 10:28 Tiger-1 conducts a visual identification (VID) pass of the helicopters. "Cougar, tally 2 HINDS." HINDS are Soviet Helicopters used by the Iraqi Armed Forces. AWACS replied, "Copy two HINDS". Tiger-1 then instructed Tiger-2 to make a VID pass. Thirty seconds later Tiger-2 confirms, "Tally 2." Tiger-1 to Tiger-2, "Arm hot." At 10:30AM on April 14, 1994, Tiger-1 fired an AIM 120 (medium range air-to-air missle) at Eagle-2. Tiger-2 fired an AIM 9 (Sidewinder air-to-air missle) at Eagle-1. The missles hit Eagle Flight with deadly accuracy. Tiger-1 confirmed the hits to AWACS, "Splash two HINDS." Colonel Jerald Thompson had all but wrapped up his latest assignment, commanding a humanitarian center for Kurds in northern Iraq. He was flying out by helicopter after saying farewell to the many villagers he had bonded with during his tour. But instead of returning today to an overjoyed family in North Carolina, the Oakland native will be the focus of a somber memorial ceremony Wednesday. The accident that killed the 48-year-old Army colonel has stunned America along with Thompson's family and friends in the Bay Area. He and 25 other passengers and crew members in two helicopters were shot down by two US warplanes whose pilots mistakenly thought they were enemy aircraft. Now his grief-stricken mother from San Jose and his brother from Los Gatos are remembering Thompson's life, forced to take comfort in the work he was doing in Operation Provide Comfort and a career that spanned almost 30 years. "My brother is helping us deal with the pain," said Robert Thompson. "He wouldn't want us to be vengeful and hating, because it's wasted energy. We can't change what happened." Though Thompson has received dozens of medals, his friends and family said he was not so much a warrior as a shepherd. Whatever his mission, he wanted his people to act as humanitarians. They describe him as a private, religious man who saw an opportunity to do God's work in the military. After several tours of duty in the United States, Europe and the Middle East, Thompson had the potential to become a four-star general or a high-ranking diplomat, they said. Thompson will be honored at a memorial service at Fort Bragg in North Carolina on Wednesday and is to be buried at Arlington National Cemetery Thursday. Other survivors include his wife, Eileen, a 20-year-old daughter, Jennifer, and a 15-year-old son, Eric. Relatives said little about last Thursday's tragedy, in which the Black Hawk helicopters were shot down by F-15 jets north of Irbil, Iraq. Instead, they preferred to keep the focus on Thompson himself, a decorated Vietnam War veteran who still sent his mother cards on Valentine's Day. "I think he could forgive the pilots for himself, but not for the Turkish and his friends," Robert Thompson said. Thompson, born and raised in East Oakland, showed early on the type of self-discipline and compassion that would later serve him well in the Army. The son of a Navy lieutenant had his own paper route and really cared about his customers, said his mother, Georgia Van Praag. "This one little lady couldn't get out to get her groceries," Van Praag said. "So after his paper route he would go back, get a list and get her groceries for her." After he graduated from Fremont High School in 1963, he knew exactly where he wanted to make his career. "He was a little upset with me because I wouldn't let him go in before he was 18," Van Praag said. He went to his mother's hometown in Kansas for a year until he could enlist. In 1967, he was deployed in Vietnam, rising to the rank of first lieutenant and receiving the Silver Star, the second-highest military honor, for rallying his platoon to repel an attack. "He did so well because his sense of self-discipline was so much greater than anyone was expecting," said John McPartland, whose friendship with Thompson dates back to when they were in high school together. For example, McPartland said, Thompson caught up to a member of the Viet Cong who had shot and killed his best friend. Instead of killing the enemy soldier, Thompson had the restraint to take him prisoner, McPartland said. At 5-foot-10 Thompson often commanded men who towered over him. "If you look at him in size, he's small," Robert Thompson said. "But if you know him, he's 10 feet tall." He later resigned his commission to become an underclassman at West Point. He went from being addressed as "sir" to being called "plebe" and far worse so he could get a better scope on military history and lay a stronger foundation for his career, family members said. Thompson became a specialist in the Middle East, receiving a master's degree from the University of Kansas in Middle East history and speaking 10 dialects of Arabic after graduating from the Defense Language Institute in Monterey. He was the commander of special forces in the Gulf War, once showing compassion for a soldier whose accidental gun discharge cost an American life, relatives said. But in many ways, his latest assignment expressed his beliefs best. "There are still a lot of people in very bad situations," he said in a military publication. "There are women and children living in austere, destitute conditions and it can be heart-wrenching." 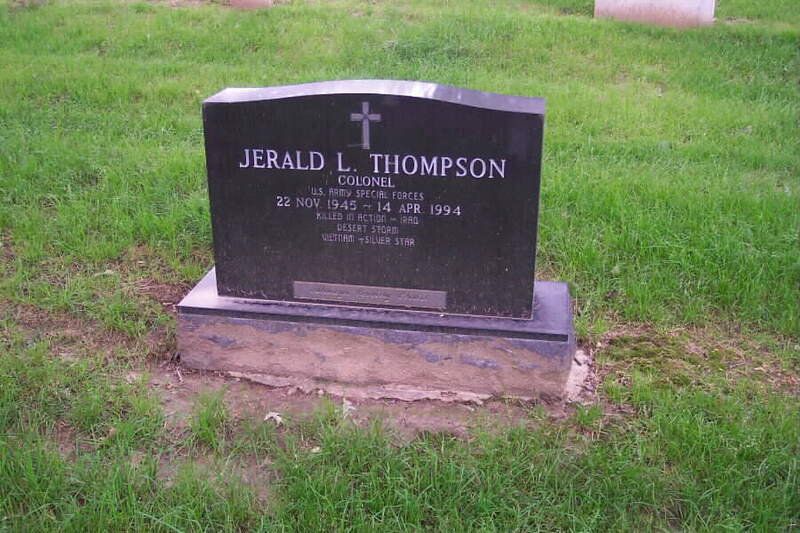 Jerald L. Thompson was born in Oakland, California on 22 November 1945. He was the oldest of two sons born to Bennett and Georgia Thompson. Throughout his high school years he was part of the Junior ROTC program. When he was 17, he enlisted in the United States Army and was sent to Fort Sill, Oklahoma. He received his commission from Officers Candidate School (OCS) in 1965. His first duty assignment as an officer was at Fort Dix, New Jersey where he was the youngest Lieutenant at 19 years of age. After serving as a Platoon Leader for 13 months in the Republic of Vietnam, he resigned his commission in order to attend the United States Military Academy at West Point. He graduated in 1971. During his 26+ year military career, Colonel Thompson served in a multitude of command and staff positions. 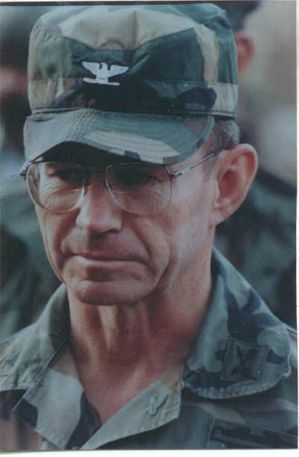 Colonel Tompson's Special Forces assignments included command of a Special Forces Operational Detachment 'A'; a company command in the 5th Special Forces Group (Airborne); and he was the Commander, 1st Battalion, 5th Special Forces Group (Airborne) from June 1989 to June 1991. Under his leadership during OPERATION DESERT SHIELD/STORM, the unit received a Valorous Unit Award for its combat operations. The also received 50 of the 70 medals awarded to 5th Special Forces Group (Airborne). After the Gulf War, Colonel Thompson was selected to command Special Operations Command Central (SOCCENT) (Forward) until the theatre SOP was established. He also commanded the U.S. Army Security Assistance Training and Management Organization (SATMO). Colonel Thompson used his unique skills in other assignments that were oriented toward the 5th Special Forces Group's area of the world and thereby had ample opportunity to use his language skills in Arabic, Persian Farsi and Persian Afghani. Most notably, he served as a Military Observer, United Nations Truce Supervisory Organization, Lebanon. He was the G5 Plans Officer, XVIII Airborne Corps; and he was the Middle East, North Africa Desk Action Officer of the Politico Military Affairs Directorate, J5, Joint Chiefs of Staff. Colonel Thompson always set the standard of conduct for his troops. A serving Christian officer, he knew the importance of and made sure of the care of each soldier's family. His deep religious convictions were reflected in his primary belief that family is a soldier's most important responsibility. Colonel Thompson's care for his soldiers was reflected in a gift from the Noncommissioned Officers and Enlisted soldiers at the end of the Gulf War. He was presented with the battalion colors, an Iraqi bayonet and khaki patches saying DESERT STORM and MISSION COMPLETE, all beautifully framed in a large shadow box. During his career, Colonel Thompson earned numerous awards and decorations including the Silver Star, Defense Superior Service Medal, Legion of Merit, Bronze Star (with Oak Leaf Cluster), Defense Meritorious Service Medal (with Oak Leaf Cluster), Meritorious Service Medal (with two Oak Leaf Clusters), Combat Infantryman Badge, Master Parachutist Badge, Pathfinder Badge, Ranger Tab, Special Forces Tab and other U.S., foreign and United Nations decorations. He graduated with honors from the University of Kansas with a Masters Degree in Middle East History and was a graduate of the U.S. Army War College. Colonel Thompson died on April 14, 1994, when the U.S. Army helicopter in which he was a passenger was shot down by the U.S. Air Force near Irbil, Northern Iraq. The two Black Hawks were mis-identified as Iraqi Hinds! Twenty-five others including 13 U.S. service members, a State Department official, six foreign officers and five Kurdish guards were also killed. At the time of his death, Colonel Thompson was serving as the Commander of the Military Coordination Center, Joint Task Force PROVIDE COMFORT. He would have relinquished command the following day. Colonel Thompson was laid to rest with full military honors on April 22, 1994 in Arlington National Cemetery. He is survived by his wife, Eileen and their two children, Jennifer and Eric, his mother Georgia VanPraag and his brother, Bob.